For previous revolutions in France, see French Revolution and July Revolution. The 1848 Revolution in France, sometimes known as the February Revolution (révolution de Février), was one of a wave of revolutions in 1848 in Europe. In France the revolutionary events ended the July Monarchy (1830–1848) and led to the creation of the French Second Republic. Following the overthrow of King Louis Philippe in February 1848, the elected government of the Second Republic ruled France. In the months that followed, this government steered a course that became more conservative. On 23 June 1848, the people of Paris rose in insurrection, which became known as June Days uprising – a bloody but unsuccessful rebellion by the Paris workers against a conservative turn in the Republic's course. On 2 December 1848, Louis Napoléon Bonaparte was elected President of the Second Republic, largely on peasant support. Exactly three years later he suspended the elected assembly, establishing the Second French Empire, which lasted until 1870. Louis Napoléon went on to become the de facto last French monarch. The February revolution established the principle of the "right to work" (droit au travail), and its newly established government created "National Workshops" for the unemployed. At the same time a sort of industrial parliament was established at the Luxembourg Palace, under the presidency of Louis Blanc, with the object of preparing a scheme for the organization of labour. These tensions between liberal Orléanist and Radical Republicans and Socialists led to the June Days Uprising. Under the Charter of 1814, Louis XVIII ruled France as the head of a constitutional monarchy. Upon Louis XVIII's death, his brother, the Count of Artois, ascended to the throne in 1824, as Charles X. Supported by the ultra-royalists, Charles X was an extremely unpopular reactionary monarch whose aspirations were far more grand than those of his deceased brother. He had no desire to rule as a constitutional monarch, taking various steps to strengthen his own authority as monarch and weaken that of the lower house. In 1830, Charles X of France, presumably instigated by one of his chief advisers Jules, Prince de Polignac, issued the Four Ordinances of St. Cloud. These ordinances abolished freedom of the press, reduced the electorate by 75%, and dissolved the lower house. This action provoked an immediate reaction from the citizenry, who revolted against the monarchy during the Three Glorious Days of 26–29 July 1830. Charles was forced to abdicate the throne and to flee Paris for the United Kingdom. 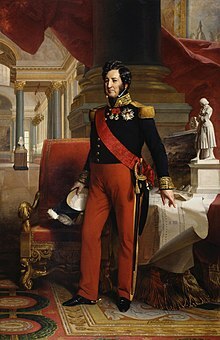 As a result, Louis Philippe, of the Orléanist branch, rose to power, replacing the old Charter by the Charter of 1830, and his rule became known as the July Monarchy. Nicknamed the "Bourgeois Monarch", Louis Philippe sat at the head of a moderately liberal state controlled mainly by educated elites. Supported by the Orléanists, he was opposed on his right by the Legitimists (former ultra-royalists) and on his left by the Republicans and Socialists. Louis Philippe was an expert businessman and, by means of his businesses, he had become one of the richest men in France. Still Louis Philippe saw himself as the successful embodiment of a "small businessman" (petite bourgeoisie). Consequently, he and his government did not look with favour on the big business (bourgeoisie), especially the industrial section of the French bourgeoisie. Louis Philippe did, however, support the bankers, large and small. Indeed, at the beginning of his reign in 1830, Jaques Laffitte, a banker and liberal politician who supported Louis Philippe's rise to the throne, said "From now on, the bankers will rule." Accordingly, during the reign of Louis Philippe, the privileged "financial aristocracy", i.e. bankers, stock exchange magnates, railroad barons, owners of coal mines, iron ore mines, and forests and all landowners associated with them, tended to support him, while the industrial section of the bourgeoisie, which may have owned the land their factories sat on but not much more, were disfavoured by Louis Philippe and actually tended to side with the middle class and laboring class in opposition to Louis Philippe in the Chamber of Deputies. Naturally, land-ownership was favoured, and this elitism resulted in the disenfranchisement of much of the middle and working classes. By 1848 only about one percent of the population held the franchise. Even though France had a free press and trial by jury, only landholders were permitted to vote, which alienated the petty bourgeoisie and even the industrial bourgeoisie from the government. Louis Philippe was viewed as generally indifferent to the needs of society, especially to those members of the middle class who were excluded from the political arena. Early in 1848, some Orléanist liberals, such as Adolphe Thiers, had turned against Louis Philippe, disappointed by his opposition to parliamentarism. A Reform Movement developed in France which urged the government to expand the electoral franchise, just as the United Kingdom of Great Britain and Ireland had done in 1832. The more radical democrats of the Reform Movement coalesced around the newspaper, La Réforme; the more moderate republicans and the liberal opposition rallied around the Le National newspaper. Starting in July 1847 the Reformists of all shades began to hold "banquets" at which toasts were drunk to "République française" (the French Republic), "Liberté, égalité, fraternité", etc. Louis Philippe turned a deaf ear to the Reform Movement, and discontent among wide sections of the French people continued to grow. Social and political discontent sparked revolutions in France in 1830 and 1848, which in turn inspired revolts in other parts of Europe. Workers lost their jobs, bread prices rose, and people accused the government of corruption. The French revolted and set up a republic. French successes led to other revolts including those who wanted relief from the suffering caused by the Industrial Revolution and nationalism sprang up hoping for independence from foreign rulers. Alexis de Tocqueville observed, "We are sleeping together in a volcano. ... A wind of revolution blows, the storm is on the horizon." Lacking the property qualifications to vote, the lower classes were about to erupt in revolt. The French middle class watched changes in Britain with interest. When Britain's Reform Act 1832 extended enfranchisement to any man paying taxes of £10 or more per year (previously the vote was restricted to landholders), France's free press took interest. Meanwhile, economically, the French working class may perhaps have been slightly better off than Britain's working class. Still, unemployment in France threw skilled workers down to the level of the proletariat. The only nominally social law of the July Monarchy was passed in 1841. This law prohibited the use of labour of those children under eight years of age, and the employment of children less than 13 years old for night-time work. This law was routinely flouted. The year 1846 saw a financial crisis and bad harvests, and the following year saw an economic depression. A poor railway system hindered aid efforts, and the peasant rebellions that resulted were forcefully crushed. According to French economist Frédéric Bastiat, the poor condition of the railway system can largely be attributed to French efforts to promote other systems of transport, such as carriages. Perhaps a third of Paris was on social welfare. "Dangerous" writers proliferated such as Louis Blanc ("The right to work") and Pierre-Joseph Proudhon ("Property is theft!"). Bastiat, who was one of the most famous political writers of the 1840s, had written countless works concerning the economic situation before 1848, and provided a different explanation of why the French people were forced to rise in the revolt. He believed that the main reasons were primarily the political corruption, along with its very complex system of monopolies, permits, and bureaucracy, which made those who were able to obtain political favours unjustly privileged and able to dictate the market conditions and caused a myriad of businesses to collapse, as well as protectionism which was the basis for the French foreign trade at the time, and which caused businesses along the Atlantic Coast to file for bankruptcy, along with the one owned by Bastiat's family. Indeed, most of Bastiat's early works concern the situation in Bayonne and Bordeaux, two large merchant harbours before the Napoleonic Wars, gradually devastated first by Bonaparte's continental blockade, and later by the protectionist legislation of the nineteenth century. According to Bastiat's biographer, G.C. Roche, just prior to the revolution, 100,000 citizens of Lyon were described as "indigent" and by 1840 there were at least 130,000 abandoned children in France. International markets were not similarly troubled at the time, which Bastiat attributed to the freedom of trade. Indeed, a large part of French economic problems in the 1830s and 1840s were caused by the shortage and unnaturally high prices of different products which could have easily been imported from other countries, such as textiles, machines, tools, and ores, but doing so was either outright illegal at the time or unprofitable due to the system of punitive tariffs. Bastiat has also noted that the French legislators were entirely unaware of the reality and the effects of their radical policies. One of the members of the French Chamber of Deputies reportedly received a standing ovation when he proposed that the depression of 1847 was due primarily to "external weakness" and "idle pacifism". Nationalist tendencies caused France to severely restrict all international contacts with the United Kingdom, including the ban on importing tea, perceived as destructive to the French national spirit. As the United Kingdom was the largest economy in the world in the nineteenth century, France deprived itself of its most important economic partner, one that could have supplied France with what it lacked and bought surplus French goods. Such governmental policies and obliviousness to the real reasons of economic troubles were, according to Bastiat, the main causes of the French Revolution of the 1848 and the rise of socialists and anarchists in the years preceding the revolution itself. Because political gatherings and demonstrations were outlawed in France, activists of the largely middle class opposition to the government began to hold a series of fund-raising banquets. This campaign of banquets (Campagne des banquets), was intended to circumvent the governmental restriction on political meetings and provide a legal outlet for popular criticism of the regime. The campaign began in July 1847. Friedrich Engels was in Paris dating from October 1847 and was able to observe and attend some of these banquets. He wrote a series of articles on them, including "The Reform Movement in France" which was published in La Rèforme on 20 November 1847; "Split in the Camp—the Rèforme and the National—March of Democracy" published in The Northern Star on 4 December 1847; "Reform Banquet at Lille—Speech of LeDru-Rollin" published in The Northern Star on 16 December 1847; "Reform Movement in France—Banquet of Dijon" published in The Northern Star on 18 December 1847; "The Réforme and the National" published in the Deutsche-Brüsseler-Zeitung on 30 December 1847; and "Louis Blanc's Speech at the Dijon Banquet" published in the Deutsche-Brusseler-Zeitung on 30 December 1847. The banquet campaign lasted until all political banquets were outlawed by the French government in February 1848. As a result, the people revolted, helping to unite the efforts of the popular Republicans and the liberal Orléanists, who turned their back on Louis-Philippe. Anger over the outlawing of the political banquets brought crowds of Parisians flooding out onto the streets at noon on 22 February 1848. They directed their anger against the Citizen King Louis Philippe and his chief minister for foreign and domestic policy, François Pierre Guillaume Guizot. Shouting "Down with Guizot" ("À bas Guizot") and "Long Live the Reform" ("Vive la réforme") the crowds marched past Guizot's residence. They erected barricades in the streets of Paris, and fighting broke out between the citizens and the Parisian municipal guards. At 2 pm the next day, 23 February, Prime Minister Guizot resigned. Upon hearing the news of Guizot's resignation, a large crowd gathered outside the Ministry of Foreign Affairs. An officer ordered the crowd not to pass, but people in the front of the crowd were being pushed by the rear. The officer ordered his men to fix bayonets, probably wishing to avoid shooting, but in what is widely regarded as an accident, a soldier discharged his musket and the rest of the soldiers then fired into the crowd. Fifty-two people were killed. Paris was soon a barricaded city. Omnibuses were turned into barricades, and thousands of trees were felled. Fires were set, and angry citizens began converging on the royal palace. Louis-Philippe, fearing for his life, abdicated in favour of his nine-year-old grandson Philippe, Comte de Paris and fled to England in disguise. A strong undercurrent of republican sentiment prevented Philippe from taking his place as king. Frédéric Bastiat witnessed the Revolution, and reportedly rescued several workers under police fire, describing it as a "frightful, fratricidal war" and further described revolting workers as "organized, armed, and masters of the terrain, at the mercy of the most fiery demagogues". Bastiat believed that the revolution was carried out by a very large group of desperate people, who were able to organize themselves and arm quickly due to both experience from the countless riots and previous revolutions, but at the same time were almost instantly manipulated by a small group of demagogues who assumed command, which is the reason why the protesters' demands were largely incompatible with one another; e.g., a drastic reduction of taxes and greater social benefits, with the latter requiring higher taxes hence contradicting the first demand. During and soon after the events of February, Bastiat's pamphlets were reportedly plastered throughout Paris and published in both conservative and socialist newspapers. In them, he urged the French people not to listen to the demagogues and argued that their demands were both incompatible with each other aimed at fooling them and aimed to use their sentiments for the demagogues’ own political gain. He also wrote many articles in response to the socialist demands to abolish private property, which were also very popular at the time, and received response from chief socialist leaders such as Pierre Proudhon. Indeed, they exchanged letters which were published in socialist newspapers such as La Voix du Peuple. "Messieurs Victor Hugo and Émile de Girardin try to raise Prince Louis upon a shield [in the heroic Roman fashion]: not too steady!" Honoré Daumier's satirical lithograph published in Le Charivari, 11 December 1848. On 26 February 1848, the liberal opposition came together to organize a provisional government, called the Second Republic. The poet Alphonse de Lamartine was appointed president of the provisional government. Lamartine served as a virtual dictator of France for the next three months. Elections for a Constituent Assembly were scheduled for 23 April 1848. The Constituent Assembly was to establish a new republican government for France. In preparation for these elections, two major goals of the provisional government were universal suffrage and unemployment relief. Universal male suffrage was enacted on 2 March 1848, giving France nine million new voters. As in all other European nations, women did not have the right to vote. However, during this time a proliferation of political clubs emerged, including women's organizations. Relief for the unemployed was achieved by the provisional government through enactment of the National Workshops, which guaranteed French citizens' "right to work". The "right" of a citizen to work and indeed the National Workshops themselves had been the idea of Jean Joseph Louis Blanc. By May 1848 the National Workshops were employing 100,000 workers and paying out daily wages of 70,000 livres. Full employment proved far from workable, as unemployment may have peaked at around 800,000 people, with much under-employment on top of that. On May 31, 15,000 jobless French rioted as rising xenophobia persecuted Belgian workers in the north. In 1848, 479 newspapers were founded alongside a 54% decline in the number of businesses in Paris, as most wealth had evacuated the city. There was a corresponding decline in the luxury trade and credit became expensive. Naturally, the provisional government was disorganized as it attempted to deal with France's economic problems. The conservative elements of French society were wasting no time in organizing against the provisional government. After roughly a month, conservatives began to openly oppose the new government, using the rallying cry "order", which the new republic lacked. Additionally, there was a major split between the citizens of Paris and those citizens of the more rural areas of France. The provisional government set out to establish deeper government control of the economy and guarantee a more equal distribution of resources. To deal with the unemployment problem, the provisional government established National Workshops. The unemployed were given jobs building roads and planting trees without regard for the demand for these tasks. The population of Paris ballooned as job seekers from all over France came to Paris to work in the newly formed National Workshops. To pay for the new National Workshops and the other social programmes, the provisional government placed new taxes on land. These taxes alienated the "landed classes"—especially the small farmers and the peasantry of the rural areas of France—from the provisional government. Hardworking rural farmers were resistant to paying for the unemployed city people and their new "Right to Work" National Workshops. The taxes were widely disobeyed in the rural areas and, thus, the government remained strapped for cash. Popular uncertainty about the liberal foundations of the provisional government became apparent in the 23 April 1848 elections. Despite agitation from the left, voters elected a constituent assembly which was primarily moderate and conservative. In May, Jacques-Charles Dupont de l'Eure, chairman of the provisional government, made way for the Executive Commission, a body of state acting as Head of State with five co-presidents. The results of the 23 April 1848 election were a disappointment to the radicals in Paris except for the election of one candidate popular among urban workers, François-Vincent Raspail. Many radicals felt the elections were a sign of the slowing down of the revolutionary movement. These radicals in Paris pressured the government to head an international "crusade" for democracy. Independence of other European states such as Poland was urged by the Paris radicals. In 1848, Poland did not exist as a nation state. The nation of Poland had been gradually "partitioned" or divided between foreign powers of Prussia, Russia, and Austria in 1773 and 1793. Finally in 1795, all of the Polish nation was absorbed by the three powers. It was an opportune time to raise the issue of Polish independence as Poles were also undergoing their own period of revolt in 1848 starting with the uprising in Poznań on 20 March 1848. The government of the National Constituent Assembly continued to resist the radicals. The radicals began to protest against the National Constituent Assembly government. On 15 May 1848, Parisian workmen, feeling their democratic and social republic was slipping away, invaded the Assembly en masse and proclaimed a new Provisional Government. This attempted revolution on the part of the working classes was quickly suppressed by the National Guard. The leaders of this revolt—Louis Auguste Blanqui, Armand Barbès, François Vincent Raspail and others—were arrested. The trial of these leaders was held in Bourges, France, from March 7 to April 3, 1849. The conservative classes of society were becoming increasingly fearful of the power of the working classes in Paris. They felt a strong need for organization and organized themselves around the need for "order"—the so-called "Party of Order". For the Party of Order the term "order" meant a rollback of society to the days of Louis Philippe. The Party of Order was now the dominant member of the government. As the main force of reaction against revolution, the Party of Order forced the closure of the hated Right to Work National Workshops on 21 June 1848. On 23 June 1848, the working class of Paris rose in protest over the closure of the National Workshops. On that day 170,000 citizens of Paris came out into the streets to erect barricades. To meet this challenge, the government appointed General Louis-Eugène Cavaignac to lead the military forces suppressing the uprising of the working classes. General Cavaignac had been serving in the Army in Algeria. Cavaignac had returned from Algeria and in the elections of 23 April 1848, he was elected to the National Constituent Assembly. Cavaignac arrived in Paris only on 17 May 1848 to take his seat in the National Assembly. Between 23 June and 26 June 1848, this battle between the working class and Cavaignac came to be known as the June Days uprising. Cavaignac's forces started out on 23 June 1848 with an army composed of from 20,000 to 30,000 soldiers of the Paris garrison of the French Army. Cavaignac began a systematic assault against the revolutionary Parisian citizenry, targeting the blockaded areas of the city. He was not able to break the stiff opposition put up by the armed workers on the barricades on 23 June 1848. Accordingly, Cavaignac's forces were reinforced with another 20,000–25,000 soldiers from the mobile guard, some additional 60,000 to 80,000 from the national guard. Even with this force of 120,000 to 125,000 soldiers, Cavaignac still required two days to complete the suppression of the working-class uprising. In February 1848, the workers and petite bourgeoisie had fought together, but now, in June 1848, the lines were drawn differently. The working classes had been abandoned by the bourgeois politicians who founded the provisional government. This would prove fatal to the Second Republic, which, without the support of the working classes, could not continue. Although the governmental regime of the Second Republic continued to survive until December 1852, the generous, idealistic Republic to which the February Days had given birth, ended with the suppression of the "June Days". The "Party of Order" moved quickly to consolidate the forces of reaction in the government and on 28 June 1848, the government appointed Louis Eugène Cavaignac as the head of the French state. On 10 December 1848 a presidential election was held between four candidates. Cavaignac, was the candidate of the Party of Order. Alexandre Auguste Ledru-Rollin was also a candidate in that presidential election. Ledru-Rollin was the editor of the La Réforme newspaper and as such was the leader of the radical democrats among the petty bourgeoisie. François-Vincent Raspail was the candidate of the revolutionary working classes. Louis-Napoléon Bonaparte was the fourth presidential candidate. Napoleon III won the presidential election of 10 December 1848 with 5,587,759 votes as opposed to 1,474,687 votes for Cavaignac and 370,000 votes for Ledru-Rollin. Raspail ended up a distant fourth in the balloting. Karl Marx saw the "June Days" uprising as strong evidence of class conflict. Marx saw the 1848 Revolution as being directed by the desires of the middle-class. While the bourgeoisie agitated for "proper participation", workers had other concerns. Many of the participants in the revolution were of the so-called petite (petty) bourgeoisie (small business owners). In 1848, the petty bourgeoisie outnumbered the working classes (unskilled laborers in mines, factories and stores, paid to perform manual labour and other work rather than for their expertise) by about two to one. The petty bourgeoisie had significant debt due to the economic recession of 1846–1847. By 1848, overdue business debt was 21,000,000 francs in Paris and 11,000,000 francs in the provinces. The February Revolution united all classes against Louis Philippe. The bourgeoisie joined with the working classes to fight for "proper participation" in the government for all sections and classes in society. But after the revolution, the working classes were disillusioned by their small share of that participation, and revolted in the streets. This frightened the bourgeoisie and they repressed the uprising during the June Days. The petit bourgeoisie worked the hardest to suppress the revolt. Its financial condition had deteriorated even further due to slow sales and economic dislocations of the Revolution. As of June 1848, over 7,000 shopkeepers and merchants in Paris had not paid their rent since February. During the June Days, their creditors and landlords (the finance bourgeoisie), forestalled most attempts to collect on those debts. But once the worker revolt was put down, they began to assert their claims in court. Thus, the financial bourgeoisie turned their back on the petty bourgeoisie. Bankruptcies and foreclosures rose dramatically. The petty bourgeoisie staged a large demonstration at the National Assembly to demand that the government inquire into the problem of foreclosures and for debt to be extended for businessmen who could prove that their insolvency was caused by the Revolution. Such a plan was introduced in the National Assembly but was rejected. The petty bourgeoisie was pauperized and many small merchants became part of the working class. Accordingly, the provisional government, supposedly created to address the concerns of all the classes of French society, had little support among the working classes and petit bourgeoisie. Therefore, it tended to address only the concerns of the liberal bourgeoisie. Support for the provisional government was especially weak in the countryside, which was predominantly agricultural and more conservative, and had its own concerns, such as food shortages due to bad harvests. The concerns of the bourgeoisie were very different from those of the lower classes. Support for the provisional government was also undermined by the memory of the French Revolution. The "Thermidorian reaction" and the ascent of Napoleon III to the throne are evidence that the people preferred the safety of an able dictatorship to the uncertainty of revolution. Louis Napoleon portrayed himself as "rising above politics". Each class in France saw Louis Napoleon as a return of the "great days" of Napoleon Bonaparte, but had its own vision of such a return. Karl Marx was referring to this phenomenon when he said "History repeats itself: the first time as a tragedy, the second time as a farce." Thus, the various classes and political groupings had different reasons for supporting Napoleon in the election of December 10, 1848. Napoleon himself encouraged this by "being all things to all people". Legitimists (Bourbons) and Orleans (Citizen King Louis-Philippe) monarchists saw Louis Napoleon as the beginning of a royalist restoration in France. The army believed Napoleon would have a foreign policy of war. (By contrast, the Mobile Guard supported Cavaignac in that election.) The industrial bourgeoisie felt that Napoleon would suppress further revolutionary activity. The petty bourgeoisie saw Napoleon as the rule of the debtor over the creditor, and as their saviour against the large finance capitalists. Even some of the proletariat supported Louis Napoleon (over the petty bourgeoisie socialist Alexandre Ledru-Rollin) in order to remove the hated Cavaignac and the bourgeoisie republicanism of the National Assembly which had betrayed the proletarian interests in the recent June Days. Peasants overwhelmingly supported Napoleon. Their support was so strong that the election has been seen as a coup d'état by the peasantry. Thus, one might argue, without the support of these large lower classes, the revolution of 1848 would not carry through, despite the hopes of the liberal bourgeoisie. Following the repression of the June Days, the French Revolution of 1848 was basically over. Politics in France continued to tilt to the right, as the era of revolution in France came to an end. The Party of Order and the Cavaignac dictatorship were still fearful of another popular uprising in the streets, so on 2 September 1848, the government continued the state of siege that had been in place since the June Days. Also on 2 September 1848, the National Constituent Assembly vowed not to dissolve itself until they had written a new constitution and enacted all the organic laws necessary to implement that new constitution. Although the National Constituent Assembly had attempted to write a constitution before the June Days, only a "first draft" of that constitution had been written before the repression in June 1848. This first draft still contained the phrase "Right to Work" and contained several provisions dealing with the demands of the working classes. In the eyes of the Party of Order, these provisions were now entirely unacceptable, especially in the new conservative political environment after the June Days. Accordingly, on 4 September 1848, the National Constituent Assembly, now controlled by the Party of Order, set about writing a new constitution. " The new constitution was finished on 23 October 1848 and presidential elections were scheduled for 10 December 1848. Louis Napoleon won the presidential election by a wide margin over the current dictator Louis Cavaignac and the petty bourgeoisie socialist Alexandre Ledru-Rollin. Louis Napoleon's family name rallied support to his cause. Elected with Louis Napoleon was a National Assembly which was filled with monarchists—of both the Legitimist (Bourbon) variety or the Orleanist (Louis-Philippe) variety. The Bourbons tended to support the landed aristocracy while the Orleanist tended to support the banking and finance bourgeoisie. One of those elected to the National Assembly was Adolphe Thiers who was the leader of the Orleanist party. As such, Thiers became the chief spokesman of the finance bourgeoisie, and as time went by he was tending to speak for the whole bourgeoisie, including the rising industrial bourgeoisie. After sweeping the elections, Louis Napoleon tried to return France to the old order. Although Napoleon purged republicans and returned the "vile multitude" (including Adolphe Thiers) to its former place, Napoleon III was unable to totally turn the clock back. Indeed, the presidency of Louis Napoleon, followed by the Second Empire, would be a time of great industrialization and great economic expansion of railways and banking. By the time of the December 2, 1851 coup, Louis Napoleon had dissolved the National Assembly without having the constitutional right to do so, and became the sole ruler of France. Cells of resistance surfaced, but were put down, and the Second Republic was officially over. He re-established universal suffrage, feared by the Republicans at the time who correctly expected the countryside to vote against the Republic, Louis Napoleon took the title Emperor Napoleon III, and the Second Empire began. Gustave Flaubert's novel L'éducation sentimentale uses the 1848 revolution as a backdrop for its story. Laura Kalpakian's novel Cosette uses the 1848 revolution as a primary part of the plot. Sylvia Townsend Warner's novel Summer Will Show uses the 1848 revolution as a primary part of the plot. Kurt Andersen's novel Heyday begins with one of the protagonists witnessing and unintentionally participating in the 1848 revolution. The character of Piotr Alejandrovitch Miusov, uncle and tutor of Dmitri Fyodorovich Karamazov in Fyodor Dostoyevsky's novel The Brothers Karamazov, hinted that he himself had almost taken part in the fighting on the barricades in the 1848 revolution. L'Autre Dumas (English: The Other Dumas), a 2010 French film directed by Safy Nebbou, depicts Alexandre Dumas in a fictitious involvement with a young female revolutionary. Rachel Field's novel All This And Heaven Too (1938) uses unrest leading up to the 1848 revolution as a backdrop for its story. Alexis de Tocqueville's Recollections (also known as Souvenirs) provides primary insight from a moderate liberal in the Constituent Assembly, as he saw events unfold. Rudin, the protagonist of Ivan Turgenev's novel of the same name, dies at the barricades of the revolution in the epilogue. Sylvie Aprile, la Deuxième République et le Second Empire, Pygmalion, 2000. Arnaud Coutant, 1848, Quand la République combattait la Démocratie, Mare et Martin, 2009. Inès Murat, La Deuxième République, Fayard, 1987. George Rudé, The Crowd in History, Chapter 11, "The French Revolution of 1848", pp. 164–179. (London: Serif, 2005). Philippe Vigier, La Seconde République, PUF, collection Que Sais-Je? ^ a b c Albert Guèrard, France, A Modern History, p. 301. ^ Albert Guèrard, France: A Modern History, p. 286. ^ Agnes de Stoeckl, King of the French: A Portrait of Louis Philippe, 1773–1850, New York: G.P. Putnam & Sons, 1957) pp. 146–160. ^ Albert Guèrard, France: A Modern History p. 289. ^ a b "Class Struggles in France" in Collected Works of Karl Marx and Frederick Engels, Volume 10, p. 48. ^ "The Reform Movement in France" in Collected Works of Karl Marx and Frederick Engels: Volume 6 p. 380. ^ Georges Duveau, 1848: The Making of a Revolution (New York: Vintage Books, 1968) p. 7. ^ "Class Struggles in France" in the Collected Works of Karl Marx and Frederick Engels: Volume 10, p. 54. ^ See Arnaud Coutant, Tocqueville et la Constitution démocratique, Mare et Martin, 2008. ^ Heinrich Gemkow et al., Frederick Engels: A Biography (Dresden: Verlag Zeitim Bild, 1972) p. 131. ^ These articles are contained at pp. 375, 385, 393, 396, 406 and 409, respectively in Collected Works of Karl Marx and Frederick Engels, Volume 6. ^ "Revolution in Paris" in Collected Works of Karl Marx and Frederick Engels: Volume 6, p. 556. ^ F. Bastiat, "A letter to a Group of Supporters"
^ G.C. Roche, Frederic Bastiat, A Man Alone, ch. "Bastiat Stands Against the Tide"
^ Albert Guèrard, France: A Modern History p. 300. ^ a b "Employment and the Revolution of 1848 in France". Ohio.edu. 15 April 1998. Retrieved 3 March 2014. ^ Gérard Unger, Lamartine. Poète et homme d'Etat, Paris: Flammarion, 1998, p. 329. ^ a b c d "Class Struggles in France" in Collected Works of Karl Marx and Frederick Engels: Volume 10, p. 75. ^ Norman Davies, God's Playground: A History of Poland: Volume 1 (New York: Columbia University Press, 1982,) pp. 511–46. ^ Norman Davies, God's Playground: A History of Poland: Volume 2, pp. 81–162. ^ Norman Davies, God's Playground: A History of Poland: Volume 2, p. 341. ^ Note 117 in the Collected Works of Karl Marx and Frederick Engels: Volume 8, p. 552. ^ "Class Struggles in France" in Collected Works of Karl Marx and Frederick Engels: Volume 10, p. 88. ^ Note 53 in Collected Works of Karl Marx and Frederick Engels: Volume 10, p. 650. ^ a b "The 23rd of June" in Collected Works of Karl Marx and Frederick Engels: Volume 7, p. 130. ^ "The June Revolution: The Course of the Paris Uprising" in Collected Works of Karl Marx and Frederick Engels, pp. 160–164. ^ "The June Revolution: The Course of the Paris Uprising" in Collected Works of Karl Marx and Frederick Engels: Volume 7, p. 161. ^ "The June Revolution" in Collected Works of Karl Marx and Frederick Engels: Volume 7, p. 160. ^ For a non-Marxist analysis, see Arnaud Coutant, Tocqueville et la Constitution democratique, Mare et Martin, 2008. ^ "Class Struggles in France" in Collected Works of Karl Marx and Frederick Engels: Volume 10, pp. 75–76. ^ "Class Struggles in France" in Collected Works of Karl Marx and Frederick Engels: Volume 10, p. 74. ^ "The Eighteenth Brumaire of Louis Napoleon" in Collected Works of Karl Marx and Frederick Engels: Volume 11, p. 103. ^ a b "Class Struggles in France" in Collected Works of Karl Marx and Frederick Engels: Volume 10, p. 81. ^ a b c d "Class Struggles in France" in Collected Works of Karl Marx and Frederick Engels: Volume 10, p. 80. ^ a b "Class Struggles in France" contained in the Collected Works of Karl Marx and Frederick Engels: Volume 10, p. 77. ^ "Class Struggles in France" contained in the Collected Works of Karl Marx and Frederick Engels: Volume 10, pp. 77–78.